QR codes are one of my pet peeves, they never really caught on and I was fed up of 'brands' trying to push them as a fun, new thing. But here we are in 2016, as mobile VR is taking off and we need a way to control it. What comes along but a proof of concept VR controller made up of a piece of paper with oversized, printed letters on it: PaperStick which owes its existence to goddamn QR codes. The paper controller, which you can wave in front of your phone camera when it's in a Cardboard headset, is the work of South Korean indie developer Ko Jong-Min who showed it off to Fast.Co Design. It's designed to be printed out by the user, folded into a triangular tube and used with the $2 app Poppist. 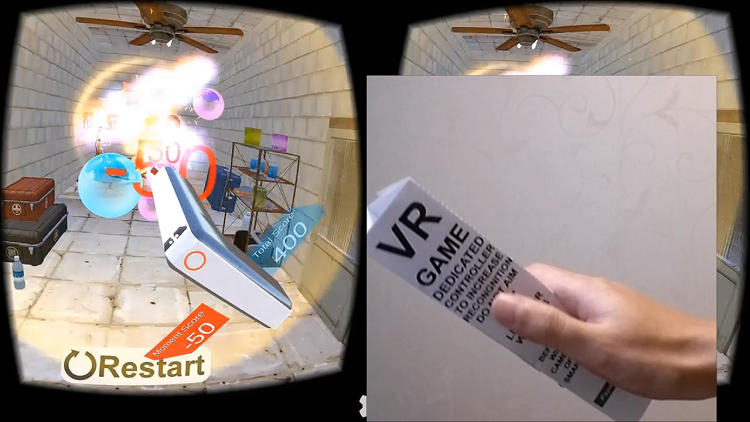 It acts as a DIY handheld controller for mobile VR and in the virtual world can be represented as a virtual laser gun that pops hologram balloons in the demo game. The potential is there for it to act as anything - hands, paintbrush etc. You can tilt the PaperStick, use it to aim and press a button on the top - which the phone camera can see in order to track. Jong-Min is experimenting with the size of the paper - make it a bigger sheet and less of a stick and the tracking improves, though at the expense of the 'stick' ergonomics. Hmm, tricky. Leap Motion is working to build its accurate hand tracking into upcoming mobile VR headsets and Google's latest device, the Daydream View, comes with its own remote controller. But the appeal here is that PaperStick is essentially almost free - a bit of printer ink and a cheap app - though, of course, you won't be playing all the most popular Cardboard games with this just yet. If you fancy giving it a go as a little Christmas Cardboard project, download PaperStick here.